Hamper includes: West Coast Cooler Citra, West Coast Cooler glasses, West Coast Cooler foldable shoes and Lily O'Briens 'uglies' chocolates. West Coast Cooler know that Thursday is the ultimate girlie night. Outfits are pondered, make up considered, and plans for the weekend ahead are discussed. 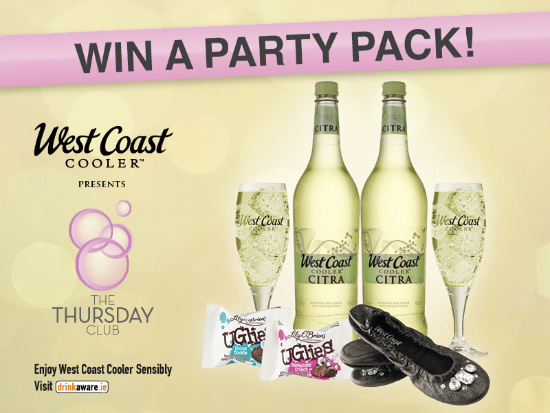 That’s why West Coast Cooler are facilitating this ultimate girls’ habit by creating The Thursday Club – a series of sparkling events for West Coast Cooler girls at 30 venues nationwide. Every week, The Thursday Club invites you to get together with the girls and redeem a voucher for a complimentary West Coast Cooler at participating outlets. In some venues, you will also find beauty and nail treatments, nibbles, spot prizes, West Coast Cooler – and a chance to win a €200 shopping spree! To join The Thursday Club and receive your complimentary West Coast Cooler and to find participating venues near you, follow West Coast Cooler on Facebook, download The Thursday Club App or text THURSDAY to 51500 (std rate SMS). As part of The Thursday Club, there will be 3 Super Thursday Events which promise to be nights to remember: pampering zones, spot prizes and one lucky winner on the night will receive a €1k Dundrum Town Centre shopping spree. The first event takes place in Dublin in The Morrison Hotel on Thursday 24th November and we have a pair of tickets and a West Coast Cooler hamper to give to one lucky Fluff & Fripperies winner! If you’re on Twitter it would be great if you could also tweet about this giveaway, but it’s not a condition of entry. This giveaway is only open to Irish residents. Entrants must be over 18 and terms and Conditions apply. Winners will be announced next Friday, 4th November. FB- Emma Zajac, sharing on FB now.